Michael Carroll continues world-building, with this story following on directly from Wolves (progs 1820-1822), where MC-1 cits of East-Meg heritage were shuttled to Mega-City Two (rather than being repatriated to East-Meg Two under a food aid deal). This was confusing for long-term readers for two reasons. On the one hand MC-2 was accidentally depicted as being soviet by the artist (and the mistake not caught by editorial). On the other hand, the last time we'd seen MC-2, it had been a nuked out wasteland (in California Babylon, progs 1731-1734), having been destroyed by Dredd during Judgement Day (progs 786-799). So, it seems like MC-2 has been (at least partially) rebuilt, although it's not clear by who. All that aside, this tale covers a secret high-level meeting between Chief-Judge Hershey and the East-Meg envoy Larionov. There follows an assassination attempt by a high-tech cyborg and a dramatic chase involving Dredd and East-Meg Judge Caterina Tanechka Pax, who ends up defecting to MC-1 as part of the denouement. A wonderful melding of ideas: this is Spaced crossed with Big Bang Theory by way of Quantum Leap, and it knows it. 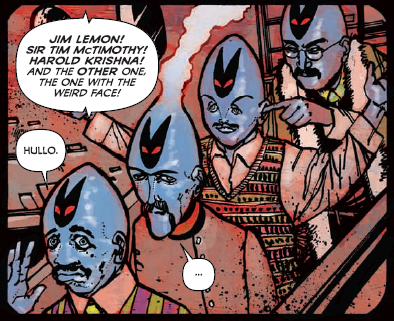 The general setup is that four nerds are trapped together in a dimension-hopping house, but to say that doesn't really do the strip justice - you should stop reading this and go and read it. It's just SO much fresher than anything else in the prog, seemingly effortlessly cool and far and away the best Tharg's 3riller so far. Melding geekdom with modern sexual politics in a wry manner, this begs (nay, demands) to be turned into a longer series. These are the continuing adventures of a ghostly investigator made corporeal by a magic jacket and armed mostly with savoir fu (which is a bit like super-chutzpah for any Paranoia fans). This is beautifully light, and manages to engross even when our hero is ineptly (& drunkenly) trying to escape (with a bounty of champagne) by riding a statue of a dolphin to freedom, or when his only hope is the disembodied head of his trusty (golem) sidekick. This is an affecting tale where Psi Judge Hamida (and her sidekick, Dredd) go up against an evil Jinn which has adopted a suicide cult (lead by Richard O'Brien) that feeds it victims who wish to be erased from reality. Whilst exploring the devastation left in the wake of Chaos Day, this also expands on the character of Hamida (who I think first showed up in Scream back in 2011), demonstrates Dredd's recurring fallibility and manages to be genuinely spooky. A tale that harks back to a simpler time - partly this is presented as a story from 70s 2000AD, although it never was - and partly as the modern story of a comic fan turned sleuth who solves a desperately sad generational mystery. One of the most enjoyable parts of this is how it gets the full support of the prog by taking over the cover in issue 1830. Boo Cook does a fantastic job of presenting the decades old comic parts alongside the modern era story (which is dingy & putrid), until a frightening, fiery climax in which the two merge. This generation-spanning space opera poetically takes us on the saga-like adventures of a wannabe space pirate on a search for the long-lost and almost mythical Earth, with an art style reminiscent of Fiona Staples work on Saga. Well you will not be disappointed with the Geeks already appearing in their own series. I'd forgotten that Survival Geeks started as a 3riller. What is it about Rennie and co writers that gets his strips commissioned as ongoing, both Survival Geeks and the current Mecha-thingie. When we have two examples of wonderful, better imho strips reviewed just here which didn't. Now whether these were set up to continue is another discussion, but there's been plenty og other examples that I would have prefered to make the grade. There's more to the history of MC2 than this, and someone with better memory than me will surely fill you it. It was a wreck, but Hondo took over for a while I think and did some rebuilding, I think there was a (somewhat rubbish) Supersurf set there in a Chopper story, and then later there was a story where it was explained why the Sovs were there. 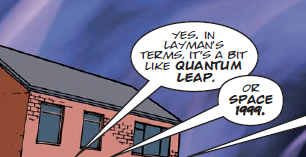 I cannot remember the details, but in Cypher this wasn't a writer/editorial slip up - it's part of the continuity. Possible an earlier Michael Carroll story set this up? Gunheadz was great, but I don't know if it would work over a longer series. I guess it could get a bit self-indulgent and impenetrable to new readers if it was mining that seam of old comics. Nice to see the old logo back for a special appearance too, I keep hoping for a one-off bog-paper version of the prog. Or at least something like that brief spell with the nicer paper in the early 100s. I would have loved to have seen that done for the 40th. There's more to the history of MC2 than this, and someone with better memory than me will surely fill you it. It was a wreck, but Hondo took over for a while I think and did some rebuilding, I think there was a (somewhat rubbish) Supersurf set there in a Chopper story, and then later there was a story where it was explained why the Sovs were there. The first Hondo takeover officially never happened - Tharg announced as much in response to a letter published during the California Babylon story. There was also a much later attempt to do the same by the Tanaka corporation during a Shimura story, which was never 'disavowed' as such, but simply never subsequently mentioned - so presumably that didn't happen either. Supersurf 13 was rather pointedly excised from the Dredd Hachette collection. 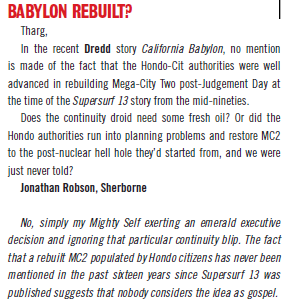 The first Hondo takeover officially never happened - Tharg announced as much in response to a letter published during the California Babylon story. From what I remember, despite that response from Tharg, Michael Carroll did eventually include an explanation: something along the lines of Hondo-Cit having given up the reconstruction as a bad job and left it half-done. I'm still in Spring of 2013, but with a different batch of thrills. Longer-running thrills have me forgetting the who's who and wondering if I should re-read the decade up to 2010 in order to appreciate them more. 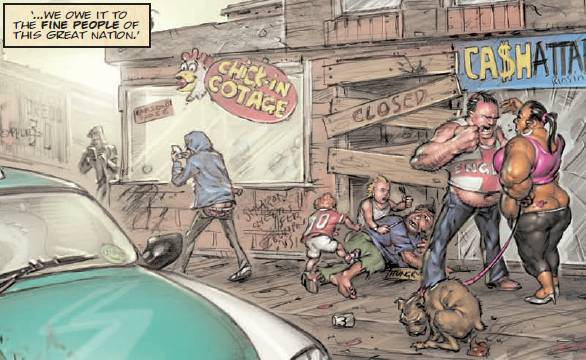 Also, I'm definitely going through a phase where I want to be able to root for the main character: and this era of 2000AD is unfortunately filled with unlikable characters. Not just anti-heroes (like Dredd), but definitely horrible characters with no moral compass. Take Johnny Alpha as an example of how to do it right: he's a bounty hunter, so that's the negative. He kills for money. But the people he kills are bad people. They deserve it. Nobody's going to weep for Stix (or his brother). And so he's more like an avenging angel: he kills bad people. He tries to do what's right. Wulf's the one that's always going on about the money. Ach, Johnny, ve only break even! So, this character Dolman turned up in Debris (progs 1792-1796), just after Chaos Day, and it was clear that I should know who it was, but I had no idea. I've since figured out he's a Dredd clone but I have no idea when he was introduced. Like: Rico is a an ex-Judda, right? 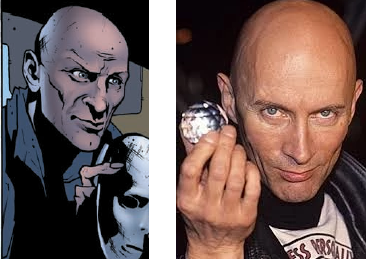 And maybe Dolman turned up sometime around Origins as a younger clone? The Forsaken follows Dolman and Dredd as they track a group of cadets that went rogue during Chaos Day. The tale is heavily structured, with each episode following a different member of the group, until a final showdown in Uranium City. We find Finnegan Sinister in a witness protection as the character Malone (initially a surprise reveal from 2006's Malone - progs 1500-1506). In the best joke on offer, he tries to get an assassination job only to find out that he's been hired as a literal cleaner replete with mop and bucket. Oh god! Uhm ... wtf. Al's a funny guy. And a bit disturbed. It's like you met a funny drunk guy down the pub who's just come up on some amphetamines and is just going off on one on this story about a relatively polite zombie. It's a stream of consciousness without a conscience. So, on the plus-side it's a funny, entertaining yarn featuring John Lennon as a psychopathically violent Scotsman. On the downside, there's no main character, and the laughs are hit and miss. Story-wise, uhm, well...that's not really the point. A bizarre one-off in which a bunch of beefcakes in Judge helmets do things like catch heat-seeker bullets in magic gloves, and replace all their 'S's with 'Z's for no narrative reason. In part of the Chaos Day aftermath, some SJS turn up in a firefight to assist Dredd, but one of them who we're supposed to know from a past story doesn't like Dredd and vows to bring him to justice for ... causing Chaos Day. Quite interesting if that plot point ever comes back. 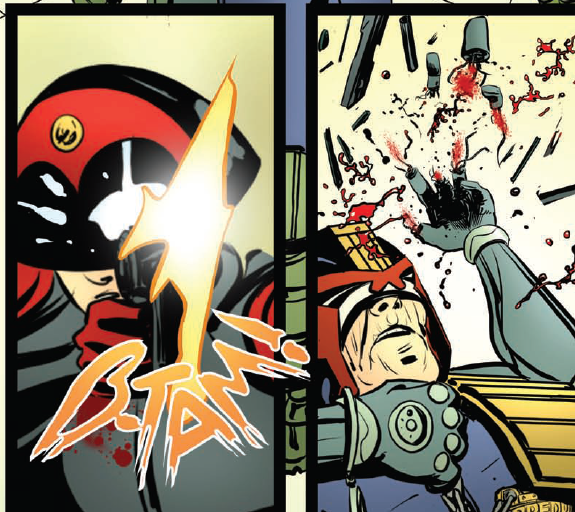 Dredd's a bit mad at the moment (the story, not the character), with so many different writers. We're at June in 2013 and so far this year there's been seven different writers. So, it's a bit like Dredd has become Future Shocks, except it's filled with characters I can't remember. I love lots of Edginton's work but Stickleback stands out as a notable exception. The great D'Israeli art and the fascinating backdrop can't help make the main character anything other than a twisted thug with a weird back. I've never been able to get around the fact that his back is this weird unreal thing that defies reality. What is it supposed to be? Plot-wise, a reptilian army in the sewers of London threaten to cut short Stickleback's recent resurrection. The last Zombo (one off aside) was five years ago. That and the recent Al Ewing interview suggesting we're a way off from seeing it return make me sad. While I defo see the point about some of the protagonists not striving for 'good' the moral ambiguity of its leds isn't really a new thing. While the Prog at this time has just lost two classic heroes in Dante and Dancer, the wide range of motives and morals has always made Tharg's parishs the most interesting. You're a bit hard on Defoe, Funt! He fights to stop the zombie hordes from overwhelming London, and secretly works to keep the nobs in line. In between he provides valuable public transport services. (And Absalom is playing a long game).